Calcium Carbonate Sea Star Shell Being Dissolved By electromagnetic radiation polarizing water molecules. The mysterious and deadly condition that’s ravaged sea star populations throughout West Coast waters is apparently close to wiping out an entire species. Although starfish are invertebrates, they do have a kind of skeleton. The bodies of starfish are composed of calcium carbonate plates, known as ‘ossicles’. These form the endoskeleton, which takes on a variety of forms such as spines and granules. 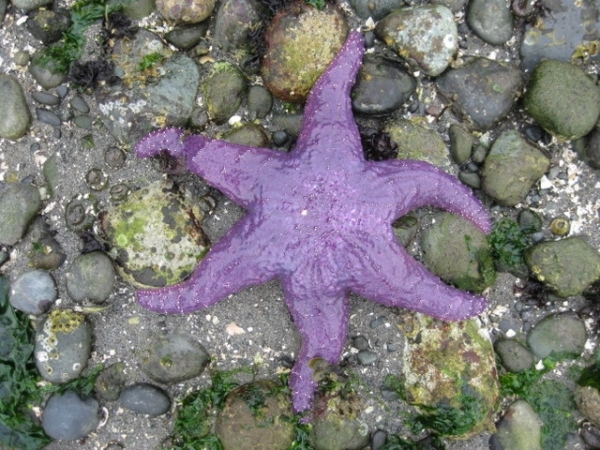 According to biologists, incidence of the so-called sea star wasting syndrome — which causes stars to literally tear themselves apart — have burst along the Oregon coast in just the last few weeks and decimated the regional population of purple ochre sea stars to such a degree, the local population of the creatures may never recover. Researchers from Oregon State University say that before last month, Oregon waters had largely remained unaffected by the fatal affliction, a virtual oasis of marine normalcy amid the destruction suffered everywhere else up and down the coastline. OK, YOU GUYS GOT IT????????? ?